Do you know the five Sunnan of Adhan? The call to prayer (adhan) is a great act of worship, its reward is not limited to the callers to prayer (mu'dh-dhin). There are five things that every Muslim should do if he hears the adhan. First: to repeat the adhan… Abu Sa'id Al-Khudri (May Allah be pleased with him) reported: Allah's Messenger (Peace Be upon Him) said, "When you hear the mu'adh-dhin (pronouncing the call to prayer), repeat after him what he says. "[Al-Bukhari and Muslim] Except when it is called "Haiyi `alassala (come for the prayer), or Haiyi ‘alafallah (come for success)", the Muslims should say "La hawla wala quwata illa billah (There is neither might nor any power except with Allah)"
This is according to what Bukhari narrated that Mu'awayah ibn Abi Sufyan (may Allah be pleased with them) who said "La hawla wala quwata illa billah (There is neither might nor any power except with Allah)" When the mu'adh-dhin said, "Haiyi 'alassala (come for the prayer) and said, "We heard your Prophet (Peace Be upon Him) saying the same." Second: When the adhan ends, we should ask Allah to exalt the Messenger’s mention. 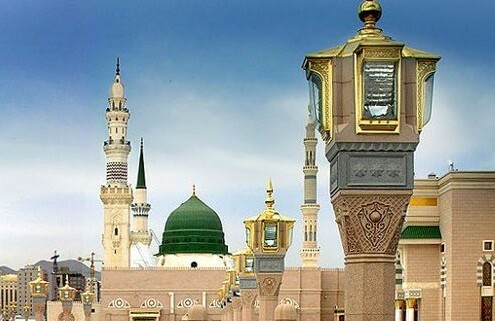 Muslim narrated from Abdullah ibn Amr, may Allah be pleased with them, that Allah's Messenger said: "…then ask Allah to exalt my mention because everyone who does so will receive in return ten rewards from Allah." Third: We beseech Allah to grant al-Wasilah to Allah's Messenger, Peace Be upon Him, as He said: “Then beseech Allah to grant me al-Wasilah, which is a high rank in Paradise, fitting for only one of Allah's servants; and I hope that I will be that man. If anyone asks al-Wasilah for me, it becomes incumbent upon me to intercede for him." Fourth: To utter the testimony of faith and proclaim our contentment with Allah as the Lord, Islam as a religion and Muhammad as Allah's Messenger. Sa'd bin Abi Waqqas narrated that Allah's Messenger (Peace Be upon Him) said: "Whoever says, when he hears the mu'adhdhin: 'Ashhadu an la ilaha illallah wahdahu la sharika lahu wa anna Muhammadan 'abduhu wa Rasuluhu, raditu Billahi Rabban, wa bi Muhammadin Rasula, wa bil-Islami dinan (I bear witness that there is none worthy of worship except Allah alone, with no partner or associate, and that Muhammad is the His servant and Messenger; I am content with Allah as my Lord, Muhammad as my Messenger and Islam as my religion),' his sins will be forgiven." Fifth: We pray to Allah for what we wish for (between the adhan and the iqamah), and it is indeed accepted by the will of Allah. Narrated Abdullah ibn Amr ibn al-'As: A man said: Messenger of Allah, the mu'adhdhins excel us (in deed by calling to prayer). The Messenger of Allah (PBUH) said: Say (the same words) as they say, and when you come to the end, supplicate (to Allah) and it will be granted to you."